Do some good by buying this print at Rose City Comic Con this weekend, in Portland Oregon. You know Hellboy would. There’s no sugar-coating what Hurricane Harvey did to Texas. The storm was devastating, dumping more rain on parts Texas in a few days than most of the state normally gets in a year. Many residents are stranded, unable to return to their homes. And more than a few of them will return to see those houses in extremely poor shape. That’s if they’re still standing at all. Needless to say, cleaning all of this up and rebuilding is going to take a lot of help- and money. 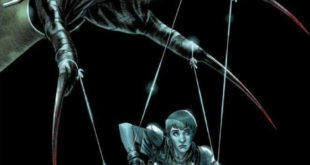 Now on the eve of another potentially destructive storm hitting Florida, and hours after a powerful earthquake struck Mexico, comes a little assistance from Dark Horse Comics. 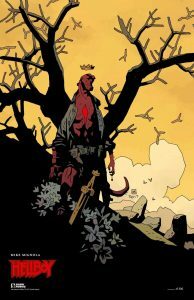 The publisher has commissioned a special print of Hellboy from the character’s creator Mike Mignola, and colorist Dave Stewart. The piece will be on sale from today through this Sunday (the 10th), and will be exclusively at Rose City Comic Con. All proceeds from these prints will go to the Houston Food Bank, to help feed those in need. Yes, all of it. In a world where charities often hack up donations, and no one’s quite sure of where their money is actually going, that’s a beautiful thing. There are not unlimited prints at the booth though, as Dark Horse only has 500 of the 11” x 17” illustrations. Let’s make sure they don’t leave with any left.